Wow, can you believe August is already here? It still feels like we were celebrating the new year not that long ago and now we are over half way through 2013...the downside to getting older - time moves way to fast! I submitted my first post to MadeByGirl last night , which I'm super excited about. It will go live sometime within the next two weeks, and of course I will keep you posted. As for today I have a super yummy and quick recipe to share that I recently took for a spin, via (my fav) Bon Appetite Magazine - a quinoa salad with peaches and pickled onions. I originally made this for the picnic that you have been reading about all week, but the great thing about this is that since then I have created another dinner around it, and had it for lunch two different ways this week. The recipe is super easy to follow and the results are amazing. Plus it travels well and requires no prep time after the initial process. 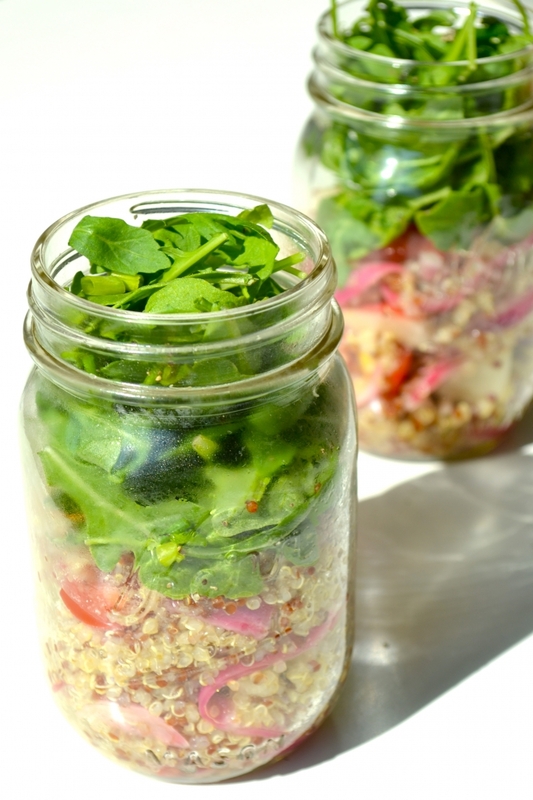 Make this on a Sunday afternoon, store in individual jars and you have a enough for a super healthy grab and go lunch for the work week.